Dr. Laura Arbour is a Professor in the Department of Medical Genetics situated at the UBC Island Medical Program, and an Affiliate Professor in the Division of Biomedical Sciences at the University of Victoria. Her clinical practice and research focuses on northern and Aboriginal health issues as they pertain to genetics. Trained as both pediatrician and clinical geneticist (McGill University), her research integrates maternal-child health issues and the understanding of the genetic component of Aboriginal health throughout the life course. Her research has been funded through the Canadian Institutes for Health Research since 2003. She leads the Community Genetics Research program situated at the University of Victoria, and works with First Nations and Inuit partners on several projects. Current research projects include: 1) Silent Genomes: Reducing health-care disparities and improving diagnostic success for Indigenous children with genetic disease, 2) Long QT Syndrome in Northern British Columbia, 3) The potential risk of CPT1A P479L for infant mortality in northern populations, 4) Primary Biliary Cholangitis in First Nations of the Pacific West Coast, and 5) First Nations cohort of the Canadian Alliance for Healthy Heart and Minds. Other research interests include the genetics of inherited arrhythmias, the understanding and prevention of congenital anomalies and other adverse birth outcomes, and etiology of rare diseases. The official website for the Silent Genomes project can be found here. For more information on the Silent Genomes project, see the attached presentation here. For a recent article on Silent Genomes featured in UBC Faculty of Medicine's digital magazine 'Pathways', click here. Inherited Long QT syndrome (LQTS), a potentially fatal condition, is recognized by a prolonged QT interval on an electrocardiogram (ECG) corrected for heart rate (QTc). A prolonged QTc increases the risk of serious heart rhythm disturbances which may lead to cardiac arrest. Variants in numerous genes important in heart rhythm are known to cause LQTS. Usually rare (about 1/2000), LQTS is common (1/125) in First Nations people of Northern BC, mainly because of a specific mutation called V205M, dating back several generations. Although many with the V205M mutation clearly have the condition and have died with it, others have lived long lives without event. In LQTS, disease severity varies broadly and risk is difficult to predict. Part of the variability may be explained by non-genetic and also by other minor gene changes, called variants. To date, we have enrolled over 800 Northern BC First Nations participants in our study, and have identified over 100 people with the V205M mutation. We have also identified 2 other variants that likely modify the severity of the condition, and another (ANK2 S646S) that causes LQTS (and other heart diseases) in those without the V205M. We are exploring these effects throughout the life course (from birth to old age), and we are also determining if additional genetic variants alone or in combination with other chronic diseases such as cardiovascular disease, increase the severity resulting in a higher risk of death. The main goal overall is to determine how risk for LQTS can be identified and reduced. On June 10th, 2018, Dr Arbour gave a talk titled 'The Genetics of Cardiovascular Disease in Indigenous Populations: From Common to Rare' at the CIHR funded International Symposium on Atherosclerosis. 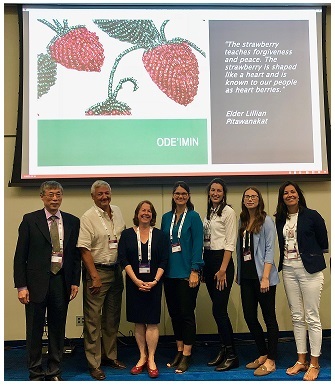 The talk was part of a wider session titled 'From Molecules to Communities - The Complexities of Indigenous Heart and Brain Health' - pictured below. Co-investigators: Andrew Krahn, Peter Mohler, Jason Roberts, Shu Sanatani. Kapplinger JD, Erickson A, Asuri S, Tester DJ, McIntosh S, Kerr CR, Morrison J, Tang A, Sanatani S, *Arbour L, *Ackerman MJ (*co-senior authors). (2017). KCNQ1 p.L353L affects splicing and modifies the phenotype in a founder population with long QT syndrome type 1. J Med Genet. 54(6):390-398. Swayne LA, Murphy NP, Asuri S, Chen L, Xu X, McIntosh S, Wang C, Lancione PJ, Roberts JD, Kerr C, Sanatani S, Sherwin E, Kline CF, Zhang M, Mohler PJ, Arbour LT. (2017). Novel Variant in the ANK2 Membrane-Binding Domain Is Associated With Ankyrin-B Syndrome and Structural Heart Disease in a First Nations Population With a High Rate of Long QT Syndrome. Circ Cardiovasc Genet. 10(1). pii:e001537. Munday FA, Asuri S, McIntosh S, Jackson H, Tang A, and Arbour L. (2016). Increased corrected QT interval (QTc) in First Nations women of Northern British Columbia with Systemic Lupus Erythematosus (SLE). International Journal of Clinical Cardiology. 3(1): 3:072. Jackson H, McIntosh S, Whittome B, Asuri S, Casey B, Kerr C, Tang A, Arbour L. (2014). LQTS in Northern BC: homozygosity for KCNQ1 V205M presents with a more severe cardiac phenotype but with minimal impact on auditory function. Clinical Genetics. 86(1): 85-90. Jackson H, Huisman LA, Sanatani S, Arbour LT. (2011). Long QT syndrome. CMAJ : Canadian Medical Association Journal. 183(11): 1272-5. Arbour L, Rezazadeh S, Eldstrom J, Weget-Simms G, Rupps R, Dyer Z, Tibbits G, Accili E, Casey B, Kmetic A, Sanatani S, Fedida D. (2008). A KCNQ1 V205M missense mutation causes a high rate of long QT syndrome in a First Nations community of northern British Columbia: a community-based approach to understanding the impact. Genetics in Medicine 10(7): 545-550, 2008. Janzen ML, Cheung C, Sanatani S, Cunningham T, Kerr C, Steinberg C, Sherwin E, Arbour L, Deyell MW, Andrade JG, Lehman AM, Gula LJ, Krahn AD. (2017). Cost Analysis of Patients Referred for Inherited Heart Rhythm Disorder Evaluation. Can J Cardiol. 33(6):814-821. Mellor G, Laksman ZWM, Tadros R, Roberts JD, Gerull B, Simpson CS, Klein GJ, Champagne J, Talajic M, Gardner M, Steinberg C, Arbour L, Birnie DH, Angaran P, Leather R, Sanatani S, Chauhan VS, Seifer C, Healey JS, Krahn AD. (2017). Genetic Testing in the Evaluation of Unexplained Cardiac Arrest: From the CASPER (Cardiac Arrest Survivors With Preserved Ejection Fraction Registry). Circ Cardiovasc Genet. 10(3). pii: e001686. doi: 10.1161/CIRCGENETICS.116.001686. PubMed PMID: 28600387. Predham S, Hathaway J, Hulait G, Arbour L, Lehman A. (2016). Patient Recall, Interpretation, and Perspective of an Inconclusive Long QT Syndrome Genetic Test Result. J Genet Couns. 26(1):150-158. Arbour L, Asuri S, Whittome B, Polanco F, and Hegele RA. (2015). The Genetics of Cardiovascular Disease in Aboriginal Populations. Canadian Journal of Cardiology. 31: 1094-1115. Janzen M, Sanatani S, Gibbs KA, Mohammed SS, Hathaway J, Arbour L, and Krahn AD. (2014). Inherited heart rhythm disorders: Diagnostic dilemmas after the sudden death of a young family member. Journal of Nursing Education and Practice. 4(3): 225. Krahn AD, Sanatani S, Gardner MJ, Arbour L. (2013). Inherited heart rhythm disease: negotiating the minefield for the practicing cardiologist. The Canadian journal of cardiology. 29(1): 122-25. Khoo C, Chakrabarti S, Arbour L, Krahn AD. (2013). Recognizing life-threatening causes of syncope. Cardiology clinics. 31(1): 51-66. 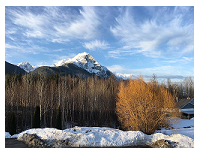 The Gitxsan First Nation is one if the 8 FN communities that make up the First Nations Cohort of the Canadian Alliance for Healthy Hearts and Minds (referred to as the FN Alliance). The FN Alliance is a sub-cohort of a pan-Canadian, prospective, multi-ethnic research cohort of adults that examines determinants of cancer, dementia, and other chronic diseases (http://cahhm.mcmaster.ca). The established FN sub-cohort (goal 2000 participants across Canada) from seven communities across Canada (BC to Nova Scotia) have provided health data (Magnetic Resonance Imaging of brain, heart, and abdomen), anthropometrics, dietary, community, lifestyle and other survey collections, as well as blood samples (~700 collected to date) for future research. Future proposed research requires a consultation process with each community involved. Project funded by: Canadian Partners Against Cancer and The Heart and Stroke Foundation. Since its discovery in 2001, the p.P479L variant of carnitine palmitoyltransferase 1A (CPT1A) has been the centre of controversy regarding its clinical significance. CPT1A is an enzyme needed to use long chain fats for energy during fasting or prolonged exercise. Classical CPT1A deficiency is a rare autosomal recessive disorder, which includes symptoms of hypoketotic hypoglycaemia, hepatic encephalopathy, seizures, and sudden unexpected death in infancy. The p.P479L variant of CPT1A is very common in Inuit and coastal BC First Nations populations, with homozygosity rates of approx 70% and 20%, respectively. Many Inuit and BC First Nations infants and children, homozygous for the variant, have presented with symptoms of CPT1A deficiency or with sudden death. In order to better understand the population implications of the p.P479L variant in the North, we determined that the variant was prevalent in the Inuit of Nunavut and the Inuvialuit of NWT. We also found that the variant was associated with unexpected infant death (SIDS, SUDI and death due to infection) in Nunavut. Other studies in Nunavut, Alaska and BC have also suggested a possible connection of the P479L variant with low blood sugar, seizures, hospitalization for respiratory infection and ear infection. The variant is of particular concern in Nunavut, which has the largest Inuit population in Canada. Nunavut leads the country for a number of adverse early child health outcomes, in particular infant hospitalizations for respiratory infection (~306/1000), which is amongst the highest in the world. Nunavut also leads the country in infant mortality, which is three times the national average (21.5 vs 4.5/1,000 live births). This study is currently on-going to understand the role of the p.P479L variant on unexpected infant deaths and infant hospitalization for respiratory infection in the context of other contributors. Policy decisions on newborn screening, respiratory syncytial virus (RSV) vaccination, and public health prevention strategies are urgently needed and will be informed by study results. Sinclair GB, Collins S, Popescu O, McFadden D, Arbour L, Vallance HD. (2012) Carnitine palmitoyltransferase I and sudden unexpected infant death in British Columbia First Nations. Pediatrics 130(5):e1162-9. Epub. Collins SA, Surmala P, Osborne G, Greenberg C, Bathory LW, Edmunds-Potvin S, Arbour L. (2012). Causes and risk factors for infant mortality in Nunavut, Canada 1999-2011. BMC Pediatr 12:190. Collins SA, Sinclair G, McIntosh S, Bamforth F, Sobol I, Osbourne G, Corriveau A, Santos M, Hanley B, Greenberg CR, Vallance H, Arbour L. (2010) Carnitine Palmitoyltransferase I P479L prevalence in live newborns in Yukon, Northwest Territories, and Nunavut. Molecular Genetics and Metabolism. 101(2-3):200-4. Epub. Collins S, Sinclair G, Osborne G, Corriveau A, Santos M, Hanley B, Bamforth F, Greenberg C, Vallance H, Arbour L. (2011). Is the CPT1A p.P479L variant a risk in unexpected infant mortality cases of Nunavut, NWT and Yukon? 12th International Congress of Human Genetics/61st Annual Meeting of the American Society of Human Genetics. October 13, 2011. Montreal QC. Special Satellite Meeting to the ACMG Clinical Genetics Conference. (2011). Screening for Carnitine-Palmitoyltransferase, Type 1A (CPT1A) in First Nations Populations: A Community Conversation. March 16, 2011. Vancouver BC. Collins SA, Osborne G, Arbour L. (2011). Understanding Infant Mortality in Nunavut (1999-2008). 4th International Meeting on Indigenous Child Health. March 6 2011. Vancouver BC. Collins SA, Sinclair G, Vallance HD, Greenberg CR, Sobol I, Corriveau A, Hanley B, Osborne G, Young TK, Arbour L. (2011). The CPT1 p.P479L Allele in Northern Canadian Populations: Does it Confer Risk for Infant Mortality? 59th Annual Meeting of the American Society of Human Genetics, October 23 2009. Honolulu, Hawaii. Collins S, Sinclair G, Vallance H, Arbour L. (2009). CPT1 P479L in Canada’s North: Should we be carrying out newborn screening? Canadian Public Health Agency (CPHA) 2009 Annual Conference. June 10 2009. Winnipeg MB. Previously known as Primary Biliary Cirrhosis, Primary Biliary Cholangitis (PBC) is the most common reason for liver transplant referrals among the First Nations People of British Columbia. PBC is a rare chronic, progressive liver disease with a presumed autoimmune basis. It can cause symptoms such as chronic fatigue and itching, and often leads to liver failure. PBC generally strikes women between the ages of 40-60 and there is currently no cure. Both environmental and genetic factors are believed to play a role in the development of PBC. We have studied PBC in British Columbia's Coastal First Nations people, who have an 8 times higher referral rate for liver transplantation for PBC than non-First Nations, although they represent only 4% of the over-all BC populations. Within this population, we also investigated a connection with inflammatory arthritis and other autoimmune conditions. Our goal was to identify specific genetic factors by carrying out genetic linkage of affected families and individuals in BC Coastal First Nations people that predispose to PBC development. A genetic linkage study is currently being published. This project is no longer active. If you, or one of your family members, have a diagnosis of PBC and would like more information regarding this research, please contact our Research Coordinator, Sarah McIntosh, at 1-888-853-8924 or sarahmc@uvic.ca. Ko HH, Chung H, McMahon B, Hurlburt K, Arbour L, Yoshida E. (2006). Liver disease in the indigenous communities of the arctic, sub-arctic and pacific northwest: an approach to investigations of Alaska Natives and the First Nations of British Columbia. BC Medical Journal 48(5):216-221. Arbour L, Cook D. (2006). DNA on loan: issues to consider when carrying out genetic research with Canadian Aboriginal populations. Community Genet 9(3):153-160. Yoshida EM, Riley M, Arbour LT. (2006). Autoimmune liver disease and the Canadian First Nations Aboriginal communities of British Columbia's Pacific Northwest[LG4] . World J Gastroenterol 12(23):3625-3627. Arbour L, Rupps R, Field L, Ross P, Erikson A, Henderson H, Hill W, Yoshida E. (2005). Characteristics of primary biliary cirrhosis in British Columbia's First Nations people[LG5] . Can J Gastroenterol (5):305-310. Arbour L, Field L, Erikson A, Yoshida E. (2003). The mystery of primary biliary cirrhosis in British Columbia's First Nations people[LG6] . Int J Circumpolar Health 63(Suppl 2):185-188. Yoshida EM, Caron NR, Buczkowski AK, Arbour LT, Scudamore CH, Steinbrecher UP, Erb SR, Chung SW. (2000). Indications for liver transplantation in British Columbia's Aboriginal population: a ten year retrospective analysis. Canadian Journal of Gastroenterology 14(9):775-779. Exposure to contaminants during pregnancy has been associated with certain adverse birth outcomes that require further investigation. The project builds on work carried out by our team mapping community-level relative risks of adverse birth outcomes in BC in relation to environmental contaminants. Geographical information systems (GIS) have become a powerful tool in epidemiologic and public health research; mapping potential sources of exposure along with birth outcome data creates opportunities to investigate environmental health relationships that can act as an exploratory step to identify 'hotspot' areas suitable for more rigorous investigations. Anders Erickson, PhD student: (completed July 2016). Erickson AC, Ostry A, Chan LHM, and Arbour L. (2016). The reduction of birth weight by fine particulate matter and its modification by maternal and neighbourhood-level factors: a multilevel analysis in British Columbia, Canada. Environmental Health. 15(51): 1-19. Erickson AC, Ostry A, Chan LHM, and Arbour L. (2016). Air pollution, neighbourhood and maternal-level factors modify the effect of smoking on birth weight: a multilevel analysis in British Columbia, Canada. BMC Public Health. 16(1): 585. Erickson A and Arbour L. (2014). The Shared Pathoetiological Effects of Particulate Air Pollution and the Social Environment on Fetal-Placental Development. Journal of Environmental and Public Health. 2014(doi:): 10.1155/2014/901017. Erickson AC, Arbour LT. (2012). Heavy smoking during pregnancy as a marker for other risk factors of adverse birth outcomes: a population-based study in British Columbia, Canada.BMC public health. 12: 102. If you'd like to learn more about this project, please contact Dr. Laura Arbour at larbour@uvic.ca. Our objective was to utilize the data from the Aboriginal Children Survey 2006 to understand early Inuit health in Canada. Survey results from the four Inuit regions and Inuit living outside the regions were analyzed in this one year project funded through Health Canada that aims to provide insights on prevention of Sudden Infant Death Syndrome, breast feeding practices, chronic diseases and access to health care. Asuri S and Arbour L. (2010). Looking to the Future: Report on determinants of Breastfeeding in the Inuit Regions of Canada. 12. Health Canada and ITK (Posted on ITK website). Asuri S, Arbour L. (2010). Looking to the Future: Report on prevention of SIDS in Inuit regions. 15. Health Canada and ITK (Posted on ITK website). Chart reviews and Canadian-wide jurisdictional comparisons have confirmed that the over-all congenital anomaly rate is increased in Nunavut. This increase is largely secondary to heart defects, especially septal, which were 3-4 times higher than expected in reviews from 1989-1994 and 2000-2006. Genetic, nutritional, environmental and social determinants have been implicated and continue to be under study. If you would like to know more, please contact Dr. Laura Arbour at larbour@uvic.ca. Arbour L, Rupps R, MacDonald S, Forth M, Yang, J, Nowdluk M., Osborne, G. (2007). Congenital Heart Defects in Canadian Inuit: Is More Folic Acid Making a Difference? Alaska Medicine, 49(2) 163-166. Arbour L, Gilpin C, Millor-Roy V, Pekeles G, Egeland GM, Hodgins S, Eydoux P. (2004). Heart defects and other malformations in the Inuit of Canada: a baseline study. Int J Circumpolar Health 63(3):251-266. Arbour L, Vaktskjold A. (2010). A review of the Current State of Circumpolar Perinatal Outcomes and Birth Defect Surveillance. Copenhagen, Denmark: Navigating a Northern Focus on Birth Outcome Surveillance and Research: The First International Symposium, May 2010. Sy C., Cowan J, Sobol I, Osborne G, Arbour L. (2009). Chart Review Analysis of Maternal Factors and Major Malformations on Baffin Island 2000-2005. Yellowknife, NWT, International Congress of Circumpolar Health 14, July 2009. Orlaw C, Rouleau J, Hanley B, Corriveau, A, Sobol I, Arbour L. (2009). Congenital Anomalies in Canada's Northern Territories. Yellowknife, NWT: International Congress of Circumpolar Health 14, July 2009. Arbour L, Osborne G, Rupps R, Forth M, Nowdlak M, Egeland G, Field L, Rozen R. (2007). Genetic and Nutrient Determinants of Congenital Heart Defects in Nunavut. ASHG, San Diego, California, October 2007. Mehaffey K, Higginson A, Cowan J, Osborne GM, Arbour LT. (2010). Maternal smoking at first prenatal visit as a marker of risk for adverse pregnancy outcomes in the Qikiqtaaluk (Baffin) Region. Rural and remote health. 10(3): 1484. Arbour L, Melnikov V, McIntosh S, Olsen B, Osborne G, Vaktskjold A. (2009). The Current State of Birth Outcome and Birth Defect Surveillance in Northern Regions of the World. Int J Circumpolar Health 68(5):443-58. Auger N, Quach C, Healy-Profitós J, Lowe AM, Arbour L, (2017). Congenital microcephaly in Quebec: baseline prevalence, risk factors and outcomes in a large cohort of neonates. Arch Dis Child Fetal Neonatal Ed. 2017 Jul 4. pii: fetalneonatal-2016-311199. doi: 10.1136/archdischild-2016-311199. [Epub ahead of print] PubMed PMID: 28676560. Auger N, Fraser WD, Arbour L, Bilodeau-Bertrand M, Kosatsky T. (2017). Elevated ambient temperatures and risk of neural tube defects. Occup Environ Med. 74(5):315-320. Foster WG, Evans JA, Little J, Arbour L, Moore A, Sauve R, León JA, Luo W. (2016) Human exposure to environmental contaminants and congenital anomalies: a critical review. Critical Reviews in Toxicology. 47(1), pp.59-84. Auger N, Fraser W, Arbour L, Healy-Profitós J, Drolet B. (2016). Preeclampsia and risk of infantile hemangioma. British Journal of Dermatology. 176(2), pp.371-377. Bassil K, Skarsgard E, Yang J, Arbour L, Moineddin R, Brindle M, and Hazell E.(2016). Spatial Variability of Gastroschisis in Canada, 2006-2011: An Exploratory Analysis. Canadian Journal of public health. 103(2): 111-118. Skarsgard ED, Meaney C, Bassil K, Brindle M, Arbour L, Moineddin R, and Canadian Pediat Surg Network. (2015). Maternal Risk Factors for Gastroschisis in Canada. Birth Defects Research Part A-Clinical and Molecular Teratology. 103(2): 111-118. Auger N, Fraser WD, Healy-Profitós J, and Arbour L. (2015). Association between preeclampsia and congenital heart defects.JAMA. 314(15): 1588-1598. Shariff F, Peters P, Arbour L, Greenwood M, Skarsgard E, and Brindle M. (2015). Maternal and community predictors of gastroschisis and congenital diaphragmatic hernia in Canada. Pediatric Surgery International. 3(11): 1055-60. Teschke K, Abanto Z, Arbour L, Beking K, Chow Y, Gallagher RP, Jong B, Le ND, Ratner PA, Spinelli JJ, Dimich-Ward H. (2011). Exposure to anesthetic gases and congenital anomalies in offspring of female registered nurses. American journal of industrial medicine. 54(2): 118-27. Dimich-Ward H, Le Nhu D, Beking K, Dybuncio A, Spinelli JJ, Gallagher RP, Ratner PA, Arbour L, Teschke K. (2011). Congenital anomalies in the offspring of nurses: association with area of employment during pregnancy. International journal of occupational and environmental health. 17(3): 195-201. Arbour LT, Beking K, Le ND, Ratner PA, Spinelli JJ, Teschke K, Gallagher RP, Abanto ZU, Dimich-Ward H. (2010). Rates of congenital anomalies and other adverse birth outcomes in an offspring cohort of registered nurses from British Columbia, Canada. Canadian journal of public health. 101(3): 230-4. Godwin KA, Sibbald B, Bedard T, Kuzeljevic B, Lowry RB, Arbour L. (2008). Changes in frequencies of select congenital anomalies since the onset of folic acid fortification in a Canadian birth defect registry. Canadian journal of public health = Revue canadienne de santé publique. 99(4): 271-5. Since Nunavut became a territory, there has been an increasing need to establish its own territorial maternal and child health data collection system. Although some prenatal and postnatal information is currently collected, there is no existing comprehensive system, which can bring all of this data together into one cohesive database. Previous independent research studies have shown that Nunavut has increased infant mortality, birth defects (specifically heart defects), paediatric rickets and hearing loss compared to the rest of Canada. In order to effectively prevent these issues, the Department of Health & Social Services in collaboration with Dr. Laura Arbour, developed the Nutaqqavut Health Information System (NHIS). This project was initially funded by a team grant for Circumpolar Health through CIHR and was developed in partnership with NHIS was built with the intent to supply Nunavut with public health information to plan for health services to focus future action plans on prevention and treatment and to provide an opportunity to investigate trends, evaluate causes of specific pregnancy outcomes and analyze risk factors in mothers and children. After extensive consultations, a revised Prenatal Record, new Nunavut Well-Baby Records (adapted from the Rourke Well-Baby Record) and a Birth Defect Report form for the territory was introduced. This project is not active, please contact Sorcha Collins (scollins@uvic.ca) if you have any questions. Lauson S, McIntosh S, Obed N, Healey G, Asuri S, Osborne G, Arbour L. (2011).The development of a comprehensive maternal-child health information system for Nunavut-Nutaqqavut (Our Children). Int J Circumpolar Health. 70(4):363-72. Arbour L, Healey G, Orlaw, C, Lauson, S, McIntosh S, Osborne G. (2009). The Development of a Comprehensive Maternal Child Health Surveillance System for Nunavut. Platform presentation. 3rd International Meeting on Indigenous Child Health. (Albuquerque, NM). Anand SS, Abonyi S, Arbour L, Brook J, Bruce S, Castleden H, Desai D, de Souza RJ, Harris S, Irvine J and Lai C. (2018). Canadian Alliance for Healthy Hearts and Minds: First Nations Cohort Study Rationale and Design. Progress in Community Health Partnerships: Research, Education, and Action, 12(1), pp.55-64. Asuri S, McIntosh S, Taylor V, Rokeby A, Kelly J, Shumansky K, Field LL, Yoshida EM and Arbour L. (2018). Primary Biliary Cholangitis in British Columbia First Nations–Clinical features and discovery of novel genetic susceptibility loci. Liver Int. 2018;00:1‐9. Ayoub A, Fraser WD, Low N, Arbour L, Healy-Profitós J, and Auger N. (2018). Risk of central nervous system defects in offspring of women with and without mental illness. Archives of women's mental health, 1-8. Auger N, Arbour L, Schnitzer ME, Healy-Profitós J, Nadeau G, and Fraser WD. (2018). Pregnancy outcomes of women with spina bifida. Disability and rehabilitation, 1-7. Mellor G, Laksman ZWM, Tadros R, Roberts JD, Gerull B, Simpson CS, Klein GJ, Champagne J, Talajic M, Gardner M, Steinberg C, Arbour L, Birnie DH, Angaran P, Leather R, Sanatani S, Chauhan VS, Seifer C, Healey JS, Krahn AD, (2017). Genetic Testing in the Evaluation of Unexplained Cardiac Arrest: From the CASPER (Cardiac Arrest Survivors With Preserved Ejection Fraction Registry). Circ Cardiovasc Genet. 10(3). pii: e001686. doi: 10.1161/CIRCGENETICS.116.001686. PubMed PMID: 28600387. Erickson AC, Ostry A, Chan LHM, and Arbour L. (2016). Air pollution, neighbourhood and maternal-level factors modify the effect of smoking on birth weight: a multilevel analysis in British Columbia, Canada. BMC public health, 16(1), p.585. Auger N, Fraser W, Arbour L, Healy-Profitós J, Drolet B. (2016). Preeclampsia and risk of infantile hemangioma. British Journal of Dermatology. 176(2), pp.371-377. doi: 10.1111/bjd.14958. Shariff F, Peters P, Arbour L, Greenwood M, Skarsgard E, and Brindle M. (2015). Maternal and community predictors of gastroschisis and congenital diaphragmatic hernia in Canada. Pediatric Surgery International.3(11): 1055-60. Caron NR,Thira SA, McCormick RM, Butler-Walker JJE, Lalonde CE, Arbour L, Vedan RW, Jovel EM. (2014). Capacity Interrupted: The Kloshe Tillicum Graduate Student Training Experience. Canadian Journal of Native Education. 37(1): 165-192. Erickson, A and Arbour L. (2014). The Shared Pathoetiological Effects of Particulate Air Pollution and the Social Environment on Fetal-Placental Development. Journal of Environmental and Public Health. 2014(doi:): 10.1155/2014/901017. Krahn AD, Sanatani S, Gardner MJ, Arbour L. (2013). Inherited heart rhythm disease: negotiating the minefield for the practicing cardiologist.The Canadian journal of cardiology. 29(1): 122-25. Arbour L. (2013). Developing Healthy Communities: Understanding maternal child health determinants in Nunavut. International Journal of Circumpolar Health. 72(Supplemt 1): 51-55. Sinclair GB, Collins S, Popescu O, McFadden D, Arbour L, Vallance HD. (2012). Carnitine palmitoyltransferase I and sudden unexpected infant death in British Columbia First Nations. Pediatrics. 130(5): e1162-9. Tsang E, Rupps R, McGillivray B, Eydoux P, Marra M, Arbour L, Langlois S, Friedman JM, Zahir FR. (2012). Life-history chronicle for a patient with the recently described chromosome 4q21 microdeletion syndrome. American journal of medical genetics. Part A. 158A(10): 2606-9. Niederhoffer KY, Peñaherrera M, Pugash D, Rupps R, Arbour L, Tessier F, Choufani S, Zhao C, Manokhina I, Shuman C, Robinson WP, Weksberg R, Boerkoel CF. (2012). Beckwith-Wiedemann syndrome in sibs discordant for IC2 methylation. American journal of medical genetics. Part A. 158A(7): 1662-9. Collins SA, Surmala P, Osborne G, Greenberg C, Bathory LW, Edmunds-Potvin S, Arbour L. (2012). Causes and risk factors for infant mortality in Nunavut, Canada 1999-2011.BMC pediatrics. 12: 190. Lauson S, McIntosh S, Obed N, Healey G, Asuri S, Osborne G, Arbour L. (2011). 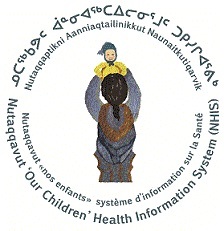 The development of a comprehensive maternal-child health information system for Nunavut-Nutaqqavut (Our Children).International journal of circumpolar health. 70(4): 363-72. McLarren KW, Severson TM, du Souich C, Stockton DW, Kratz LE, Cunningham D, Hendson G, Morin RD, Wu D, Paul JE, An J, Nelson TN, Chou A, DeBarber AE, Merkens LS, Michaud JL, Waters PJ, Yin J, McGillivray B, Demos M, Rouleau GA, Grzeschik KH, Smith R, Tarpey PS, Shears D, Schwartz CE, Gecz J, Stratton MR, Arbour L, Hurlburt J, Van Allen MI, Herman GE, Zhao Y, Moore R, Kelley RI, Jones SJ, Steiner RD, Raymond FL, Marra MA, Boerkoel CF. (2010). Hypomorphic temperature sensitive alleles of NSDHL cause CK syndrome. American journal of human genetics. 87(6): 905-14. Arbour L, Parkinson A, Kulig JC. (2010). Human health at the ends of the earth. Rural and remote health. 10(2): 1534. Slade I, Stephens P, Douglas J, Barker K, Stebbings L, Abbaszadeh F, Pritchard-Jones K, FACT collaboration [including Arbour LT], Cole R, Pizer B, Stiller C, Vujanic G, Scott RH, Stratton MR, Rahman N. (2010). Constitutional translocation breakpoint mapping by genome-wide paired-end sequencing identifies HACE1 as a putative Wilms tumour susceptibility gene. Journal of medical genetics. 47(5): 342-7. Peters S, Cowan J, Osborne G, Sobol I, Arbour L. (2010). Rates of Hospitalization for Lung Infection of Inuit Infants from the Baffin Region and Association with Heart Defects 2000-2004. International Journal of Circumpolar Health: Proceedings of the 14th International Congress of Circumpolar Health. Supplements(7): 258-262. Collins SA, Sinclair G, McIntosh S, Bamforth F, Thompson R, Sobol I, Osborne G, Corriveau A, Santos M, Hanley B, Greenberg CR, Vallance H, Arbour L. (2010). Carnitine palmitoyltransferase 1A (CPT1A) P479L prevalence in live newborns in Yukon, Northwest Territories, and Nunavut. Molecular genetics and metabolism. 101(2-3): 200-4. Mehaffey K, Higginson A, Cowan J, Osborne GM, Arbour LT. (2010). Maternal smoking at first prenatal visit as a marker of risk for adverse pregnancy outcomes in the Qikiqtaaluk (Baffin) Region.Rural and remote health. 10(3): 1484. Arbour L, Melnikov V, McIntosh S, Olsen B, Osborne G, Vaktskjold A. (2009). The current state of birth outcome and birth defect surveillance in northern regions of the world. International journal of circumpolar health. 68(5): 443-58. Caulfield T, Fullerton SM, Ali-Khan SE, Arbour L, Burchard EG, Cooper RS, Hardy BJ, Harry S, Hyde-Lay R, Kahn J, Kittles R, Koenig BA, Lee SS, Malinowski M, Ravitsky V, Sankar P, Scherer SW, Séguin B, Shickle D, Suarez-Kurtz G, Daar AS. (2009). Race and ancestry in biomedical research: exploring the challenges. Genome medicine. 1(1): 8. Friedman J, Adam S, Arbour L, Armstrong L, Baross A, Birch P, Boerkoel C, Chan S, Chai D, Delaney AD, Flibotte S, Gibson WT, Langlois S, Lemyre E, Li HI, MacLeod P, Mathers J, Michaud JL, McGillivray BC, Patel MS, Qian H, Rouleau GA, Van Allen MI, Yong SL, Zahir FR, Eydoux P, Marra MA. (2009). Detection of pathogenic copy number variants in children with idiopathic intellectual disability using 500 K SNP array genomic hybridization. BMC genomics. 10: 526.
du Souich C, Chou A, Yin J, Oh T, Nelson TN, Hurlburt J, Arbour L, Friedlander R, McGillivray BC, Tyshchenko N, Rump A, Poskitt KJ, Demos MK, Van Allen MI, Boerkoel CF. (2009). Characterization of a new X-linked mental retardation syndrome with microcephaly, cortical malformation, and thin habitus. American journal of medical genetics. Part A. 149A(11): 2469-78. Arbour L (principle author), Fernandez C (principle author), Albersheim S, Fernandez C, Hilliard R, Razack S, Templeton C (Board Representative), Tsai E(Chair). (2008). Guidelines for genetic testing of healthy children - addendum. Paediatrics and child Health. 13(4): 311. Scott RH, Douglas J, Baskcomb L, Huxter N, Barker K, Hanks S, Craft A, Gerrard M, Kohler JA, Levitt GA, Picton S, Pizer B, Ronghe MD, Williams D; Factors Associated with Childhood Tumours (FACT) Collaboration [including Arbour LT], Cook JA, Pujol P, Maher ER, Birch JM, Stiller CA, Pritchard-Jones K, Rahman N.(2008). Constitutional 11p15 abnormalities, including heritable imprinting center mutations, causenonsyndromic Wilms tumor. Nature Genetics. 40(11): 1329-1334. Arbour L, Rezazadeh S, Eldstrom J, Weget-Simms G, Rupps R, Dyer Z, Tibbits G, Accili E, Casey B, Kmetic A, Sanatani S, Fedida D. (2008). A KCNQ1 V205M missense mutation causes a high rate of long QT syndrome in a First Nations community of northern British Columbia: a community-based approach to understanding the impact. Genetics in medicine : official journal of the American College of Medical Genetics. 10(7): 545-50. Tyson C, Qiao Y, Harvard C, Liu X, Bernier FP, McGillivray B, Farrell SA, Arbour L, Chudley AE, Clarke L, Gibson W, Dyack S, McLeod R, Costa T, Vanallen MI, Yong SL, Graham GE, Macleod P, Patel MS, Hurlburt J, Holden JJ, Lewis SM, Rajcan-Separovic E. (2008). Submicroscopic deletions of 11q24-25 in individuals without Jacobsen syndrome: re-examination of the critical region by high-resolution array-CGH. Molecular cytogenetics. 1: 1-9. Chung HV, Riley M, Ho JK, Leung B, Jevon GP, Arbour LT, Barker C, Schreiber R, Yoshida EM. (2007). Retrospective review of pediatric and adult autoimmune hepatitis in two quaternary care centres in British Columbia: increased prevalence seen in British Columbia's First Nations community. Canadian journal of gastroenterology. 21(9): 565-8. Arbour L, Rupps R, MacDonald S, Forth M, Yang J, Nowdluk M, Osbourne G.(2007). Congenital heart defects in Canadian Inuit: is more folic acid making a difference?. Alaska Medicine: Proceedings of the 13th International Congress of Circumpolar Health. 49(2 Suppl): 163-6. Ko HH, Chung H, McMahon B, Hurlburt K, Arbour L, Yoshida E.(2006). Liver disease in the indigenous communities of the arctic, sub-arctic and pacificnorthwest: an approach to investigations of Alaska Natives and the First Nations of British Columbia. British Columbia Medical Journal. 48(5): 216-221. Altman AD, McLaughlin J, Schellenberg R, Penner C, Arbour L, Tsang P, Ballem P, Lim KI. (2006). Hereditary angioedema managed with low-dose danazol and C1 esterase inhibitor concentrate: a case report. Journal of obstetrics and gynaecology Canada. 28(1): 27-31. Arbour L, Cook D. (2006). DNA on loan: issues to consider when carrying out genetic research with aboriginal families and communities. Community genetics. 9(3): 153-60. Yoshida EM, Riley M, Arbour LT. (2006). Autoimmune liver disease and the Canadian First Nations Aboriginal Communities of British Columbia's Pacific Northwest. World journal of gastroenterology : WJG. 12(23): 3625-7. Friedman JM, Baross A, Delaney AD, Ally A, Arbour L, Armstrong L, Asano J, Bailey DK, Barber S, Birch P, Brown-John M, Cao M, Chan S, Charest DL, Farnoud N, Fernandes N, Flibotte S, Go A, Gibson WT, Holt RA, Jones SJ, Kennedy GC, Krzywinski M, Langlois S, Li HI, McGillivray BC, Nayar T, Pugh TJ, Rajcan-Separovic E, Schein JE, Schnerch A, Siddiqui A, Van Allen MI, Wilson G, Yong SL, Zahir F, Eydoux P, Marra MA. (2006). Oligonucleotide microarray analysis of genomic imbalance in children with mental retardation. American journal of human genetics. 79(3): 500-13. Arbour L, Rupps R, Field L, Ross P, Erikson A, Henderson H, Hill W, Yoshida E. (2005). Characteristics of primary biliary cirrhosis in British Columbia's First Nations population. Canadian journal of gastroenterology. 19(5): 305-10..
Tyson C, Harvard C, Locker R, Friedman JM, Langlois S, Lewis ME, Van Allen M, Somerville M, Arbour L, Clarke L, McGilivray B, Yong SL, Siegel-Bartel J, Rajcan-Separovic E. (2005). Submicroscopic deletions and duplications in individuals with intellectual disability detected by array-CGH. American journal of medical genetics. Part A. 139(3): 173-85. Gair JL, Arbour L, Rupps R, Jiang R, Bruyère H, Robinson WP. (2005). Recurrent trisomy 21: four cases in three generations.Clinical genetics. 68(5): 430-5. Robinson WP, McGillivray B, Lewis ME, Arbour L, Barrett I, Kalousek DK. (2005). Prenatally detected trisomy 20 mosaicism. Prenatal diagnosis. 25(3): 239-44. Egeland GM, Berti P, Soueida R, Arbour LT, Receveur O, Kuhnlein HV. (2004). Age differences in vitamin A intake among Canadian Inuit. Canadian journal of public health. 95(6): 465-9..
Arbour L, Gilpin C, Millor-Roy V, Platt R, Pekeles G, Egeland GM, Hodgins S, Eydoux P. (2004). Heart defects and other malformations in the Inuit in Canada: a baseline study. International journal of circumpolar health. 63(3): 251-66. Arbour L, Field L, Ross P, Erikson A, Yoshida E. (2004). The mystery of primary biliary cirrhosis in British Columbia's First Nations people. International journal of circumpolar health. 63 Suppl 2: 185-8. Canadian Pediatrics Society (principle Author: Arbour L). (2003). Guidelines for genetic testing of healthy children. Paediatrics and Child Health. 8(1): 42-45. Hanks S, Adams S, Douglas J, Arbour L, Atherton DJ, Balci S, Bode H, Campbell ME, Feingold M, Keser G, Kleijer W, Mancini G, McGrath JA, Muntoni F, Nanda A, Teare MD, Warman M, Pope FM, Superti-Furga A, Futreal PA, Rahman N. (2003). Mutations in the gene encoding capillary morphogenesis protein 2 cause juvenile hyaline fibromatosis and infantile systemic hyalinosis. American journal of human genetics. 73(4): 791-800. Aubertin G, Cripps S, Coleman G, McGillivray B, Yong SL, Van Allen M, Shaw D, Arbour L. (2002). Prenatal diagnosis of apparently isolated unilateral multicystic kidney: implications for counselling and management. Prenatal diagnosis. 22(5): 388-94. Rahman N, Dunstan M, Teare MD, Hanks S, Edkins SJ, Hughes J, Bignell GR, Mancini G, Kleijer W, Campbell M, Keser G, Black C, Williams N, Arbour L, Warman M, Superti-Furga A, Futreal PA, Pope FM. (2002). The gene for juvenile hyaline fibromatosis maps to chromosome 4q21.American journal of human genetics. 71(4): 975-80. Arbour L, Christensen B, Delormier T, Platt R, Gilfix B, Forbes P, Kovitch I, Morel J, Rozen R. (2002). Spina bifida, folate metabolism, and dietary folate intake in a Northern Canadian aboriginal population. International journal of circumpolar health. 61(4): 341-51. Rajcan-Separovic E, Robinson WP, Stephenson M, Pantzar T, Arbour L, McFadden D, Guscott J. (2001). Recurrent trisomy 15 in a female carrier of der(15)t(Y;15)(q12;p13).American journal of medical genetics. 99(4): 320-4. Rahman N, Arbour L, Houlston R, Bonaïti-Pellié C, Abidi F, Tranchemontagne J, Ford D, Narod S, Pritchard-Jones K, Foulkes WD, Schwartz C, Stratton MR. (2000). Penetrance of mutations in the familial Wilms tumor gene FWT1.Journal of the National Cancer Institute. 92(8): 650-2. Arbour LT, Silver K, Hechtman P, Treacy EP, Coulter-Mackie MB. (2000). Variable onset of metachromatic leukodystrophy in a Vietnamese family. Pediatric neurology. 23(2): 173-6. Yoshida EM, Caron NR, Buczkowski AK, Arbour LT, Scudamore CH, Steinbrecher UP, Erb SR, Chung SW. (2000). Indications for liver transplantation in British Columbia's Aboriginal population: a 10-year retrospective analysis. Canadian journal of gastroenterology. 14(9): 775-9. Christensen B, Arbour L, Tran P, Leclerc D, Sabbaghian N, Platt R, Gilfix BM, Rosenblatt DS, Gravel RA, Forbes P, Rozen R. (1999). Genetic polymorphisms in methylenetetrahydrofolate reductase and methionine synthase, folate levels in red blood cells, and risk of neural tube defects. American journal of medical genetics. 84(2): 151-7. Bishai R, Arbour L, Lyons C, Koren G. (1999). Intrauterine exposure to clomiphene and neonatal persistent hyperplastic primary vitreous. Teratology. 60(3): 143-5. Razack S, Arbour L, Hutcheon R. (1999). Proposed model for interaction between residents and residency training programs, and pharmaceutical industry. Annals (Royal College of Physicians and Surgeons of Canada). 32(2): 93-6. Shkolny DL, Beitel LK, Ginsberg J, Pekeles G, Arbour L, Pinsky L, Trifiro MA. (1999). Discordant measures of androgen-binding kinetics in two mutant androgen receptors causing mild or partial androgen insensitivity, respectively. The Journal of clinical endocrinology and metabolism. 84(2): 805-10. Rahman N, Abidi F, Ford D, Arbour L, Rapley E, Tonin P, Barton D, Batcup G, Berry J, Cotter F, Davison V, Gerrard M, Gray E, Grundy R, Hanafy M, King D, Lewis I, Ridolfi Luethy A, Madlensky L, Mann J, O'Meara A, Oakhill T, Skolnick M, Strong L, Stratton MR. (1998). Confirmation of FWT1 as a Wilms' tumour susceptibility gene and phenotypic characteristics of Wilms' tumour attributable to FWT1.Human genetics. 103(5): 547-56. Kukuvitis A, Deal C, Arbour L, Polychronakos C. (1997). An autosomal dominant form of familial persistent hyperinsulinemic hypoglycemia of infancy, not linked to the sulfonylurea receptor locus. The Journal of clinical endocrinology and metabolism. 82(4): 1192-4. Rahman N, Arbour L, Tonin P, Baruchel S, Pritchard-Jones K, Narod SA, Stratton MR. (1997). The familial Wilms' tumour susceptibility gene, FWT1, may not be a tumour suppressor gene. Oncogene. 14(25): 3099-102. Rahman N, Arbour L, Tonin P, Renshaw J, Pelletier J, Baruchel S, Pritchard-Jones K, Stratton MR, Narod SA. (1996). Evidence for a familial Wilms' tumour gene (FWT1) on chromosome 17q12-q21.Nature genetics. 13(4): 461-3. Treacy E, Arbour L, Chessex P, Graham G, Kasprzak L, Casey K, Bell L, Mamer O, Scriver CR. (1996). Glutathione deficiency as a complication of methylmalonic acidemia: response to high doses of ascorbate. The Journal of pediatrics. 129(3): 445-8. Arbour L, Watters GV, Hall JG, Fraser FC. (1996). Multifactorial inheritance of non-syndromic macrocephaly. Clinical genetics. 50(2): 57-62. Arbour L, Rosenblatt B, Clow C, Wilson GN. (1988). Postoperative dystonia in a female patient with homocystinuria. The Journal of pediatrics. 113(5): 863-4. Auger N, Fraser WD, Arbour L. Preeclampsia and Congenital Heart Defects--Reply. JAMA. 2016 Mar 15;315(11):1168-9. doi: 10.1001/jama.2015.19084. PubMed PMID: 26978217. Arbour L. (2010). Genetics, population genetics and birth defects in the North -- (Commentary). International Journal of Circumpolar Health: Proceedings of the 14th International Congress of Circumpolar Health. Supplements(7): 183-185. Arbour L , Narod S , Glendon G , Pollak M , Seymour R , Miner L , Leung P. (1994). In-vitro fertilisation and family history of breast cancer.Lancet. 344(8922): 610-1. Chapter 1 of Medically Assisted Procreation. The Law Reform Commission of Canada. Protection of Life Series, Working Paper, 65, 1992, Government of Canada Publications. Arbour L, Barney L, Enns C, Foster M, Henson C, Sinclair G, Stockler S, Vallance H, Withers K, 2014. Prevention and Management of Hypoglycaemia in First Nation Infants and Young Children Including Screening for CPT1a Variant in Infants and Young Children Who Present with Ketotic and Hypoketotic Hypoglycemia. BC: Child Health BC. Prevention and Management of Hypoglycaemia In BC First Nations’ Infants And Young Children. 2015-02-06. Contributors: Laura Arbour, Lucy Barney, Charmaine Enns, Melanie Foster, Carolyn Henson, Graham Sinclair, Sylvia Stockler, Hilary Vallance, Kathy Withers. This medical guideline provides evidence-based information on the prevention and management of hypoglycaemia in First Nations infants and young children. The guideline includes information about a common genetic variant (P479L) in carnitine palmitoyltransferase I (CPT1a) that may increase the risk of hypoglycaemia in infants and young children. The key message is that clinicians need to provide information to First Nations families about healthy feeding practices with an aim to prevent hypoglycaemia, especially during intercurrent illness or during periods of prolonged fasting. This information should be integrated with other key prevention and health promotion messages, including breast feeding and safe sleep promotion. Guidelines for genetic testing of healthy children: Jan 1 2003 Reaffirmed: Jan 1 2011. 2003-01-01. Number of Contributors: 10 Contributors: Laura Arbour, Paul Byrne, Christine Harrison, Ron Laxer , Bryan Magwood, Jonathan Tolkin, Consultants: Jaques Belik, John Watts, Abbyann Lynch Clinical practice and policy guidelines for genetic testing in children. Irina Manokhina is an MD and PhD scientist with fifteen years of experience in clinical and molecular genetics. She has been involved in the development of diagnostic tools for inherited conditions for the entirety of her career. Her PhD research was focused on the area of cancer genetics, and was followed by six wonderful years as a postdoctoral fellow at the University of British Columbia at the BC Children’s Hospital Research Institute (BCCHRI). She has been the recipient of many research awards including the Presidential Scholarship (Russia), Mining for Miracles Postdoctoral Fellowship (BCCHRI), and Clinical and Translational Seed Grants (BCCHRI). Her current role is working as the Scientific Project Manager on the Silent Genomes project. Her primary areas of teaching are foundations of medicine, introduction to biomedical research, laboratory diagnostics, and bioethics. She enjoys drawing, travelling, and winter sports. Sorcha Collins completed her MSc in Genetics at UBC in 2010 under the supervision of Dr. Arbour. Her graduate research assessed the causes and risk factors for infant mortality in Nunavut and whether the CPT1A p.P479L genetic variant increases risk for infant mortality in the Inuit of Nunavut and Inuvialuit of NWT. Since graduation, Sorcha has continued working with Dr. Arbour as project manager for the Nutaqqavut 'Our Children' Health Information System and Understanding and Preventing Infant Mortality in Nunavut research projects. Sorcha’s research interests include genetics, epidemiology, maternal and child health and northern health. Sarah completed her MSc in Genetic Counselling at the University of British Columbia in 2000. She began her career working in hospital-based genetics clinics in New Zealand, Vancouver and Victoria. She gradually transitioned into the research setting over the years, and joined the Community Genetics Research Program in 2006. She is involved in multiple community genetics research projects, including "Primary Biliary Cirrhosis in the First Nations People of BC", "The Impact of Long QT Syndrome on First Nations people of Northern British Columbia: A Community Based Research Program", the Northern BC First Nations cohort of the “Canadian Alliance Study for Healthy Hearts and Minds”, and "Silent Genomes". Sarah grew up in the small coastal community of Ucluelet on Vancouver Island, and finds it rewarding to collaborate with other small BC First Nations communities to tackle important research questions related to health and genetics. Kennedy completed her MSc in Genetic Counselling at the University of British Columbia in 2018. She began working as a research genetic counsellor with Dr. Arbour shortly after graduation. She is primarily involved in the community based research study "The Impact of Long QT Syndrome on First Nations people of Northern British Columbia: A Community Based Research Program”. Kennedy’s research interests include cardiac genetics, science communication, and exploring ways to improve equity and access to health care. Brittany Morgan completed her BSc in Microbiology at the University of Victoria in 2015 and is currently completing her Masters in Public Health at UVIC with an Indigenous Peoples’ Health focus area. Her previous volunteer and work experience were centered within Indigenous run organizations and non-profits. She has joined the Community Genetic Research Program as one of the Community Engagement Coordinators for the "Silent Genomes" Project. Brittany is Nuu-chah-nulth and Secwepemc, but grew up in a small community on the West Coast of Vancouver Island. Her research interests include Indigenous Peoples’ health and governance, community-based approaches, social determinants of health, and health equity. I am an Indigenous biologist working for indigenous communities. My work has to be pragmatic; it has to withstand tough questions about the purpose of research, its benefits and costs. It has to take into account community life and cultural practices, family relations and politics. I was born and raised in the Mohawk Territory of Kahnawake. Any time I enter a Native community, in some way, it’s like coming home again. I enter humbly, with wonder at how each place has created its own sense of community, and amazed at the resilience and strength it takes to heal and move forward. The Silent Genomes Project is truly looking seven generations ahead to protect our unborn, while building tools and human capacity to take care of the gift transferred to us by our ancestors. The challenge is to stay grounded, and to make sure this project is done properly so at the end of the day, our people have equitable access to the best health care. Lawrence completed his Masters of Public Health at the University of Edinburgh in 2017, and began working as a research assistant under Dr. Arbour that year. He is involved in multiple projects with the Community Genetics Research Program, and helps with literature reviews, database management, grant and publication preparation, and administration. His research interests include genetics, epidemiology, research ethics, and health promotion. “Congenital Anomalies in Nunavut: Trends and Current Status"
For individual staff or student contact information, please see our list of people in the office.